After her husband is murdered, Mildred Pierce is brought in for questioning. Once she is at the police station, she recounts the events in her life that led her to her current predicament. Our culture has changed a lot since the days of "Mildred Pierce." Though many ideas about a woman's place in the world have changed, the overall themes and the murder mystery at the center of the film still remain compelling even today. 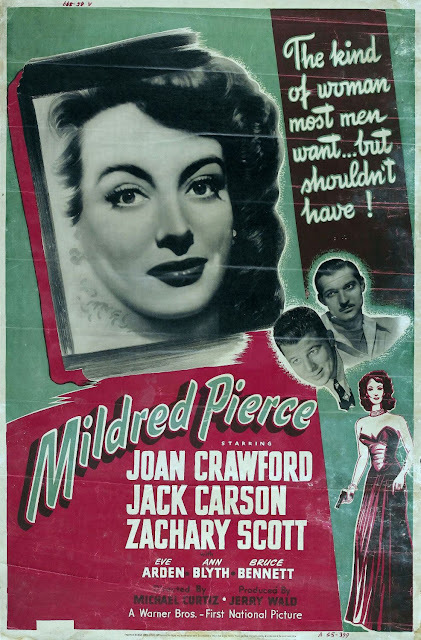 "Mildred Pierce" is directed by Michael Curtiz, who has over 170 directorial credits to his name including "The Adventures of Robin Hood" and "Casablanca." It stars Joan Crawford as the titular Mildred Pierce, who has been brought into her local police station to be questioned about her husband's murder. Once there, she tells a story of the events that led to her current husband's murder starting with her separation from her first husband all the way to being picked up by the police. Joining Crawford are Jack Carson, Anne Blyth, Zachary Scott, Bruce Bennett, and Eve Arden. "Mildred Pierce" opens with a literal bang as Monte Beragon, played by Zachary Scott, is shot while uttering the name 'Mildred' just before his death. Early on in the movie, all signs point to Mildred being the culprit, including her actions right after the event. This story, however, isn't so much about a murder, but rather about the life of Mildred Pierce. It is about how a one-time housewife and mother raising two daughters got into this position in the first place. It is about a woman who has become a self-made business person, someone who has built her own empire from the ground up, all for the sake of her narcissistic sociopathic daughter Veda, played by Ann Blyth, a girl who only cares about money and things, not people. Looking at a movie like "Mildred Pierce," the strangest thing is how so many people look down on her for working, Mildred becoming a wealthy business owner is seen as disgraceful by her daughter. The fact that Mildred runs a restaurant and smells of grease is somehow below the Beragon family name to her second husband. Oh, how times have changed. This film is steeped in drama, and we often wonder why Mildred puts up with so much crap from such an ungrateful daughter and from the condescending men in her life, but we have to chalk it up as "those were the times" and "that's what was expected of women" or it'll drive us crazy. This part of the story only works in a setting before the women's liberation movement, and the murder mystery aspect only works in a pre-cell phone, pre-internet world. The best part about this movie is the acting. It is spectacular. Joan Crawford took home an Academy Award for best actress for her part here, and we think she absolutely deserved the accolades. The film was nominated for six awards total, but Crawford is the only one who took home the gold. One person who we believe really deserved an Oscar is Eve Arden as the manager of Mildred's restaurant, Ida. Though she was nominated, she lost to Anne Revere from "National Velvet." Arden offers up some much needed comic relief and delivers many of the best, sharpest lines in the movie. This was a first-time watch for Lolo and me, and we really enjoyed "Mildred Pierce." We found it to be a very engaging film noir despite the fact that it is loaded with so many unlikable characters.